Will be a springboard for launching a Kickstarter campaign intended to expand the reach of the unique celebration and community impact into new cities. On the event celebrate the artistic culture and festive traditions of New Orleans as a tribute to loved ones not with us anymore. Festivities are kicked off by randomly crowning the year’s Royal Court of the Krewe, and then continues from spot to spot with a traditional New Orleans Second Line that parades up to the next local jazz club, dancing and waving parasols behind a live brass band. Proceeds go towards aiding the talents of exceptional music students locally and in New Orleans. 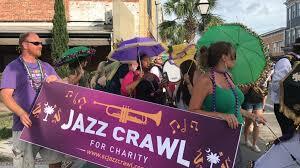 The Jazz Crawl sets the stage to promote local businesses and showcase the local creative community of musicians, artists, and performers.Barring city approvals, the date for the 4th Annual Second Line Jazz Crawl for Charity in Charleston, SC is tentatively set for July, 8th.